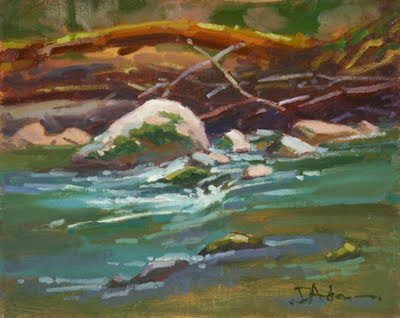 I had never seen an American Dipper or Water Ouzel in action until the day this was painted. Perhaps I hadn't taken the time to notice, but this bird flits from rock to rock, stopping where there is lots of current. In a blink it dives from the rock into the torrent of water. 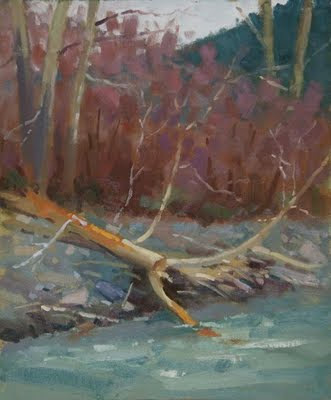 Long seconds go by and you expect to see it re-emerge forty feet downstream pulling its battered body onto a rock. Instead, out it pops about 2 inches from where it went in, happy as an Ouzel. It seems there are so many ways in this world to live a happy life, do your thing and not bother anyone. This scene is just downstream from the view in the last post. I once saw a photo of a painting held up in front of a scene. It was difficult to distinguish the painting from the reality and for that the artist was proud. I admire that kind of skill but for me it's not the point. Reinterpreting and simplifying in a way that ignites an unspoken conversation with the eventual viewer is a goal I'd like to arrive at more frequently. Those branches and the fallen tree in the background was a mass of complexity. If I did it right, that's what you feel and yet it is just a mass of color broken here and there by interesting paint strokes. It's an Ouzel thing. Treehouse Point, Fall City. When I was growing up and being exposed to job options for later in life, world renowned tree house builder was never mentioned....and yet, here I was painting on a property with I don't know how many tree houses on it that can be rented out and people come from all over the world to stay here and learn to build these things. This place has been featured on the Today Show, Good Morning America, and all kinds of programs and publications. Somehow this was not one of my choices. I might add here that no one mentioned being a painter either, but that's another story. Perhaps there is something in this painting about holding firm in the face of turmoil which is what I've been feeling watching events unfold in this country.....alas, that too is another story.....for a different blog. Suffice to say that this is the river running through the property.....and it was completely enjoyable to paint it on the first sunny day of the year. Fallen trees look so different than when standing, their limbs pushing in unexpected directions forming unexpected shapes and movement between them. 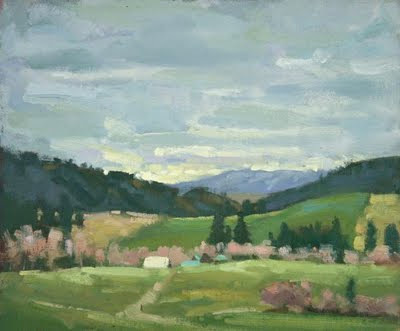 This is the second painting of the day in the Swauk Valley out of Cle Elum. It has many things in it that appeal to me: a scene that is a small slice of the world as opposed to a panorama, interesting but related color choices, repeating shapes, varied edge work, warm against cool colors, thick and thin paint application, distinct unique brush marks and small sparkles of smaller strokes. It is a painting that makes me feel good when I look at it, the cold of the day forgotten. On a cold, rainy, windy, sleety, snowy day last week I found myself painting with two good friends in the Swauk Valley, trying to push and pull Spring into existence. This rather bucolic looking painting doesn't really give you a hint about numb fingers and handwarmers. And yet it was so nice to be outdoors pushing paint around and making cold leaden skies look at least a little interesting. At first I didn't like this painting and was going to scrape it....but my hands were too cold. Now, at home and with a few corrections it does seem like an inviting place. I'll post another from that day tomorrow. 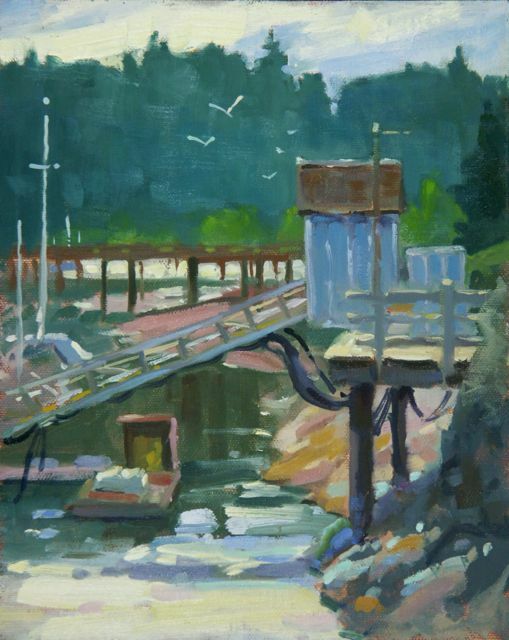 As Spring slowly moves in we begin to see low tides during the day and, when the clouds cooperate, it's possible to slip in between wet skies to actually do a painting. 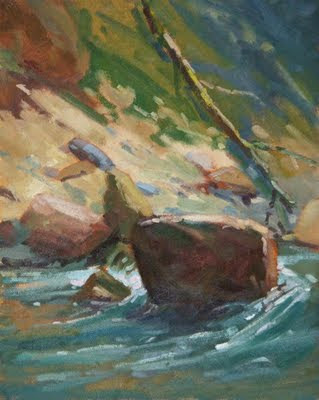 The subdued light still make vibrant color a stretch to find but in this one they were in the shadow of the dock and rocks and I like those little jewels of blue and green. This is a painting with no preliminary drawing. Using the mass of trees in the distance I blocked in around the top half of the shed. Next came the rectangular shape of the shed. After that it was just a matter of adding all the other doodads. Big shapes and doodads...that's about it. 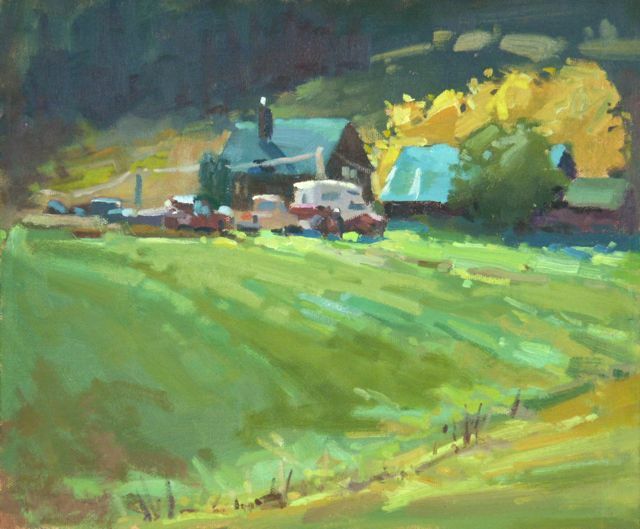 Having gotten rained out several times in the last week (and wiped off the paintings) I'm posting this one from last October. Soon all this water will pay off in scenes like this that make me want to take off my shoes and stroll through the warm grass.